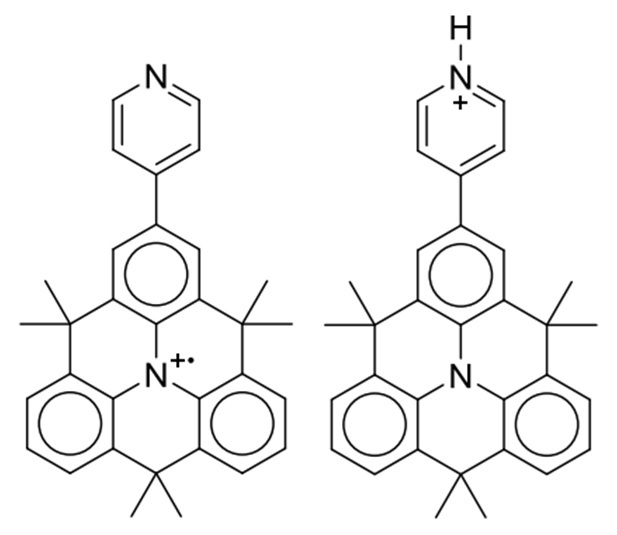 The stability of odd- vs even-electron ions derived from pyridine-substituted N-heterotriangulenes has been investigated by both experiment and theory. Isn’t it amazing that we can quickly* perform very complex quantum mechanical calculations in order to look at molecular orbitals, charges, reaction mechanisms, electronic transitions, just to name a few? Many of the questions, which are nagging our experimental colleagues, we can answer using computational chemistry tools and this way provide additional valuable and sometimes critical insight about chemical compounds that otherwise would be impossible or too difficult to obtain exclusively through experiment. No wonder, that it has become a routine practice to report theoretical analysis as complementary to the experimental research. Of course, as theory provides unique insight, experiment provides information that is still out of reach for our computational tools. As experiment benefits from theory, theory benefits from experiment: we can use directly some of the available experimental information, validate our models against experiment and either improve the model or choose another one to provide more accurate predictions. Combining experiment and theory allows us to understand the nature better than if we would look at the same problem using either experiment or theory. Combined effect is greater than the simple sum of two effects: the synergy between theory and experiment in action. That is why in addition to pure theoretical work I enjoy collaborating with the experimental colleagues. One of a product of such collaborations is our recent joint experimental and theoretical study . We have already met mono-, bis- and tris-pyridyl N-heterotriangulenes in a previous post, where their electronic properties were discussed. In the new work, these compounds have been turned into ions and then their decomposition has been investigated by carrying out collision experiments in gas phase and DFT and ab initio calculations. There are two common strategies to prepare either odd- or even-electron ions in gas phase from neutral closed-shell molecules. The first method is to prepare radical cations and the second method is to protonate molecules. Experimentally both tasks have been accomplished for pyridine–substituted N-heterotriangulenes simultaneously using electrospray ionisation. Then energy-resolved collision-induced dissociation experiments have been performed, which have shown that both ions undergo consecutive loss of methyl fragments. Just in case you (or your student) want to predict on your own which ion (radical cation of mono-pyridyl N-heterotriangulene or its protonated counterpart, left and right structures in above figure, respectively) undergoes easier first methyl loss and why, I have hidden the answer bellow. Otherwise, just click on ‘Show answer’. Intuitively, we expect that radical cation decomposes easier than protonated species and this is indeed the case. According to experiment and theory decomposition of the radical cation requires roughly half of the energy, which is necessary for the first fragmentation of protonated species. Such a big difference may appear somewhat surprising, but it can be easily understood using pen and paper. The π-system of three bottom rings of the closed-shell fragment formed after the first methyl loss from radical cation is isoelectronic with the π-system in anthracene, which is aromatic. Thus, this fragmentation product has additional stabilization due to the extended aromatic system, while no such stabilization is possible for the product of the fragmentation of the protonated species. This is confirmed by the nuclear independent chemical shifts (NICS) analysis of the initial ions and their first fragmentation products. NICS shows that all three bottom rings of the closed-shell fragment formed from radical cation are aromatic, while in all other species the middle ring in the bottom is non-aromatic. Finally, theory helped to validate experimental setup. According to theory, all further methyl losses from both radical cations and protonated species require amount of energy of the same magnitude as the first fragmentation of the protonated species. Deducing relative energies in a step-by-step dissociation experimentally is not an easy task though. The successful setup has required rather complicated procedure of isolating and selecting intermediate ions in a special ion trap instrument and only then subjecting them to fragmentation. 1. Jakob F. Hitzenberger, Pavlo O. Dral, Ute Meinhardt, Timothy Clark, Walter Thiel, Milan Kivala, Thomas Drewello, Stability of Odd- Versus Even-Electron Gas-Phase (Quasi)Molecular Ions Derived from Pyridine-Substituted N-Heterotriangulenes. ChemPlusChem 2017, 82, 204–211. DOI: 10.1002/cplu.201600416. Fittingly, this study has been featured on the front cover displaying both ‘Experiment’ and ‘Theory’ keywords (p. 161, DOI: 10.1002/cplu.201600597). The associated cover profile can be found on p. 163, DOI: 10.1002/cplu.201600596. * ‘Quickly’ means anything from minutes to months depending on how elaborate performing calculations and their analysis is. 1 Pings/Trackbacks for "Synergy Between Theory and Experiment: Stability of Pyridyl N-Heterotriangulene Ions"